Bill Amos has worked in almost every type of setting in physical therapy since he was licensed in 1980: home care, nursing homes, hospitals, in-patient, as well as out-patient settings. He was the first licensed physical therapy assistant (degree from St. Petersburg Junior College, in Florida) accepted into the Physical Therapy program at the University of Maryland, in Baltimore. 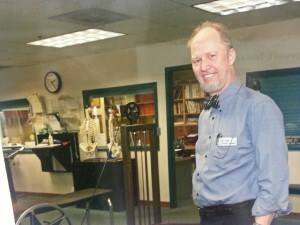 His post graduate studies have been in learning a wide variety of hands-on techniques (manual therapy) from around the world. He prefers an eclectic approach. He describes it as having “lots of tools in the tool box. If one approach doesn’t work, I’ll try another until I can figure out the problem, then correct that problem – not just treat the symptom.” He feels that his hands are his primary tools. He prefers to STAY AWAY from the No Pain-No Gain school of thought as much as possible. Philosophically, he feels that most people’s problems stem from muscles that are in spasm — turned on and unable to turn off to allow normal movement, especially in the core. This is what tends to lock up joints and backs. If the muscles can be released first, THEN you can look for weaknesses and other problems and correct them more cleanly than just WORK WORK WORK to make everything stronger. Sometimes strong is not the right answer. He’s looking for YOUR answer. Manual therapy is a broad term that describes a variety of hands-on treatment techniques that are applied to movement dysfunctions. Grade five mobilizations, Mulligan mobilizations with movement, Maitland and Kaltenborn techniques, functional technique, neural mobilization, joint mobilization, craniosacral therapy, strain/counterstrain, myofascial release, etc. These are some of the more popular manual therapy techniques. Many manual therapists will take continuing education courses, obtain certifications in manual therapy, and will sit for board certification from the American Physical Therapy Association and other organizations. Most physical therapists incorporate manual therapy techniques as a part of a complete treatment plan. Sports Rehabilitation – Athletes occasionally need an expert to assist with recovery after injury and surgery. Many sports rehabilitation specialists help with retraining the athlete utilizing running, throwing, jumping, and sport-specific programs, to name a few. A therapist with the Sports Certified Specialist (SCS) title has passed a board certified test. Fitness and Wellness – Physical therapists are well trained to help with your fitness needs and wellness programs. If you need an exercise program, have trouble with your weight, are concerned about osteoporosis, have an issue with diabetes, or you would like to learn how to prevent falls, physical therapists can help. The previous examples are just a few of the many programs physical therapists offer. Lymphedema Rehabilitation – We take it for granted, but a special component of the circulatory system, the lymph system, helps filter and drain fluid from our arms and legs. When this drainage system is damaged, painful swelling can result. Some therapists specialize in the treatment of what is called lymphedema. Special positioning, massage and bandaging techniques are utilized by the lymphedema specialist. Counterstrain or ”Positional Release” as it is sometimes called, is a hands-on treatment that alleviates muscle and connective tissue tightness by the use of very specific treatment positions held for 30-90 seconds. During the procedure, the involved tissue is ”slackened” causing a relaxation of the ”spasm” which in turn, allows local areas of inflammation, trapped within the dysfunctional tissue, to dissipate. The treatment is unusual in that it affects not only muscle tightness, but also the supportive network of connective tissue that is generally unaltered by traditional physical therapy or massage. Following this ”release” there is an immediate reduction of pain and tension in the involved tissue. This relaxation helps restore normal joint mobility and is also beneficial to the nerves and discs in the region that may have been compressed. This gentle and painless technique is effective in a variety of orthopedic conditions, including headaches, sciatica, tendonitis, chronic pain, post-surgical conditions, and even fibromyalgia. • Laser therapy can be helpful for acute injuries, such as strains, sprains, and shoulder injuries; repetitive-use injuries, such as carpal tunnel syndrome; traumatic injuries, and chronic issues, such as frozen shoulder and arthritis. Zero Balancing. Zero Balancing is a manual therapy modality in which the practitioner applies finger pressure or traction to tense tissue to enable relaxation and reorganization. Fritz Smith developed Zero Balancing from osteopathy, Rolfing, yoga, and traditional Chinese medicine. It has been described as “a bodywork modality that claims to balance energy and structure within the body”.